Kid Brooklyn Productions launches it’s inaugural lab series with two exciting projects! 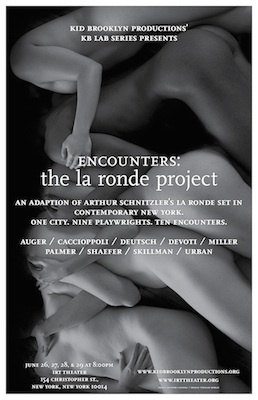 In this modern adaptation of Schnitzler’s play Kid Brooklyn Productions has commissioned nine playwrights to each write part of this theatrical series of encounters between different couplings in modern day New York. Encounters features the work of playwrights Micheline Auger, order Evan F. Caccioppoli, Troy Deutsch, Emily DeVoti, Charlotte Miller, Kristen Palmer, Sarah Shaefer, Crystal Skillman and Ken Urban. Due to mature content Encounters is recommended for age 17 and up. This series of readings will feature new plays by four extremely talented playwrights. The goal of the reading series is to allow the playwright the opportunity to get in the room with a talented director and cast to work on the play and then have a reading in front of supportive audience. No pressure and stress just a safe and creative environment to support new plays. July 2nd: A reading of a new play by Troy Deutsch. July 3rd: A reading of a new play by Micheline Auger. July 5th: A reading of a new play by Mariah MacCarthy. July 6th: A reading of a new play by Diana Stahl. Kid Brooklyn Productions: KB Lab Series: The goal the KB Lab Series is to offer a safe and creative developmental environment for new work. Each playwright/director will be given two weeks rehearsal, minimal technical aspects, and three to four performances if front of an audience. The goal of these performances are for the playwright to see the work fully staged in front of audience of their peers and theatregoers and use to go further in their development of the work. All performances will be free and feature a post-show discussion with the playwright, director, and members of the cast. Artistic Director Evan F. Caccioppoli created Kid Brooklyn Productions with the hope of creating fearless and honest theatre that explores every aspect of the human experience. Born and raised in Brooklyn, New York the name Kid Brooklyn comes from a love for where it all began and the joy of looking at things with a kid’s eyes, always fresh and new. He is a director, producer, developer of new work, teacher, and sometimes actor. This fall Evan will be attending the MFA in Directing program at The Actors Studio Drama School at Pace University.